One of the perks of the Arduino Leonardo platform compared to the more traditional Arduino Uno is the ability to appear as a USB Human Interface Device to a host computer. Instead of communicating over serial, the Leonardo can appear as any of a variety of Human Interface Devices. The Arduino software (as of 1.0.5) includes support for Keyboard and Mouse profiles, but in this post, I’ll go over how to add Remote Control and Multimedia Keys support to your Arduino Leonardo, Micro or ATMega32u4-based Arduino. This guide also reportedly works with the Arduino Due. If you find another platform that the guide works with, feel free to let me know and I’ll update this section. In short, this will enable your Arduino sketches to use the Volume Up, Volume Down, Mute, Play, Pause, Stop, Next Track, Previous Track, Rewind and Fast Forward hotkeys (and more!). This includes support for Windows, Mac, Linux, and even Android with a USB-OTG cable. Source files for everything on this page are located in their own GitHub repository. You can grab the updated source files from this GitHub repository, or modify your own in the following sections. We want to add the headers for a new Remote class which can be called by Arduino sketches, and the methods that will send individual commands to the host computer. Here, each command is encoded as the integer value of a single bit, that when set will send a matching command to the host machine. Save the file, and you’re finished with the headers. You’ll want to declare a new singleton for the Remote class, located at the top of the source file. We will add one more change to the code, adding a USB HID Descriptor for the Consumer Control Page, which hosts the typical Remote Control and Multimedia Keys available to modern operating systems. Devices define their data packets and then present a “HID descriptor” to the host. The HID descriptor is a hard coded array of bytes that describe the device’s data packets. This includes: how many packets the device supports, the size of the packets, and the purpose of each byte and bit in the packet. For example, a keyboard with a calculator program button can tell the host that the button’s pressed/released state is stored as the 2nd bit in the 6th byte in data packet number 4. Note that in the following snippet, each of the “Usage” lines corresponds to a bit of data defined in the USBAPI.h file. The final block leaves six bits remaining for passing your own additional functionality. That’s everything you need to do with the Arduino source. 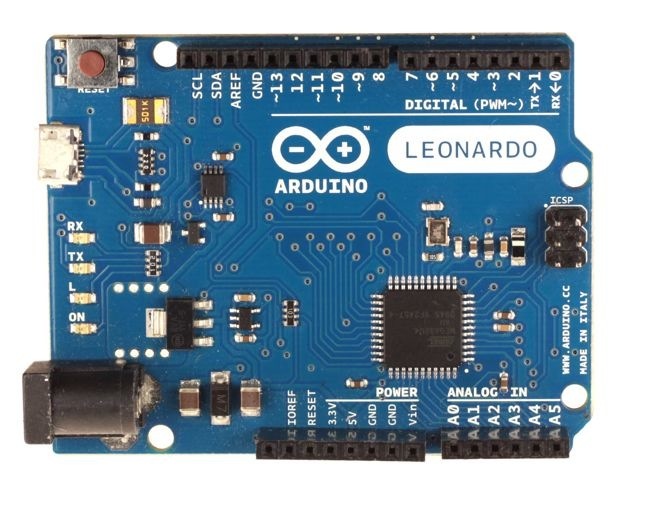 Save your work and try compiling a sketch with the profile for the ‘Arduino Leonardo’ board. If any problems persist, you can always compare with the source on GitHub. Uploading this to an Arduino should alternately mute and un-mute the system volume every five seconds. Calling Remote.clear() after each action is recommended. Alternately mute and un-mute the system volume every five seconds. In a follow-up post, I’ll be providing a method I found useful for using an IR Sensor with the Leonardo, and a version of the AdaFruit IR-Commander and Raw-IR-Decoder sketches with reduced memory requirements.